Webcams for Staffordshire. See live images and video from around Staffordshire. See what the weather is like now. is it snowing right now? My list of all webcam's for Staffordshire, Live views from across the County. 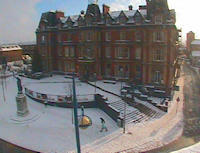 Want to see if its snowing, Raining or sunny right now, see for yourself on my local webcam page here. My other webcam pages - Derby and Derbyshire webcams. 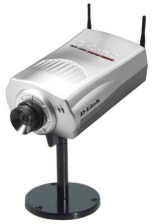 The very first Webcam was Started in 1991 in the computer science department of Cambridge University. Today there are tens of thousands of webcam's around the world that provide views into homes, offices and other buildings as well as providing panoramic views of cities and the countryside. There are several which feature Staffordshire villages which you may not have seen before, so here is my chance to introduce you to some of them. There are a wide range of webcams online, some offer a static jpg image of a scene that is updated every few minutes, some use a sequence of images that update every second or so to give the effect of video (albeit rather poor quality). With Broadband internet becoming common place these days there are a lot more websites that offer live streaming video, this allows you to see the location as though you were these with people moving around and traffic flowing etc. Certain web cam sites require you to install a small plug-in for your browser, these normally allow extra functionality to the webcam viewer such as the ability to control the angle of the webcam. In my list I have detailed which cameras work on an iPhone too. Do you want to put your own Staffordshire webcam online for the world to see? Creating your own webcam for the internet is quite easy. All you need is a pc that’s turned on most of the time (ideally all the time), a broadband internet connection, a webcam and a piece of software that will put the view onto the internet so people can see it. And of course finally you need a view for the camera out of your window or your garden which shows off your village. If you live in Staffordshire and would like your webcam to be featured on my Staffordshire Webcams page then please get in touch providing all the details using the contact link at the top of this page. It would be great to build up a large collection of staffordshire webcams so ex-pats can get an idea what it’s like here. The only rules are it must be in the county of staffordshire and offer a view of the local area. Just think of the great English scenery that we all take for granted because we live here, wouldn't it be great to share that with the world. Come on let’s put Staffordshire on the webcam map! Are you aware just how easy it is to put a webcam online, Just to prove how easy it was I tried it my self and was surprised just how simple it was to get a streaming webcam of the bird table in my garden up and running. Read my easy to follow how to guide on how to setup your own webcam for your area. Here is a list of current webcams I have found for you that feature content from within the county of Staffordshire. For each webcam I have listed what type of webcam footage it offers and if you need to install a Browser plug-in to view them. If you find any of the webcams are dead then please let me know so I can take them off my list. If you find any links contain unsuitable content then contact the owner of the website, not me! Please note : The viewing of webcams by children should always be supervised by a responsible parent. You should not allow your children to view webcam sites unattended. As these webcam sources are provided by other people they are out of the control of www.derbyphotos.co.uk so please bare this in mind. Below is my list of local Staffordshire webcams, hope you enjoy them. Get in touch if I have missed any. The following webcams are in Staffordshire. Webcam type : Static, Still images only, 640x480 pixels, dial-up ok.
Plug-ins needed? : No browser plug-ins needed to view this webcam. Updates : Offers a live image updated every 30 seconds, 7 days a week. More info : This is a static camera located in Burton town centre and provides a view of the infamous Burton Bollard. iPhone compatibility : This webcam works ok on an iPhone. Webcam type : Streaming moving image, broadband needed. Plug-ins needed? : Java runtime needed to view this webcam. Updates : Offers a streaming live image (as a series of images), 7 days a week. More info : This is a static camera located in the town of Leek. It gives a nice view looking towards the Nicholson War Memorial. This streaming webcam is excellent as it provides you with many viewing options such as the size of the capture from 192x144 pixels to 640x480, many different refresh rates. Also has MPEG-4 video streaming! Have a play with the controls on the left to see what they do. The Nicholson War Memorial has its own website if you would like to learn more about it. Webcam kindly provided by Leekonline. Webcam type : Static, Still images only, 352x288 pixels, dial-up ok. Updates : Offers a live image updated every 5 mintues, 7 days a week. More info : This is a static camera located on the roof of BBC Radio Stoke and provides a view over Albion Square of Hanley Town Hall and the Register Office. Hanley is one of the six major towns that form the city of Stoke-on-Trent. Google Streetview of the webcam. Webcam kindly provided by BBC Radio Stoke. Do you think you can find some more staffordshire webcams for this page? Updates : Offers a live image updated every 10 seconds between 9:00 and dusk 7 days a week. 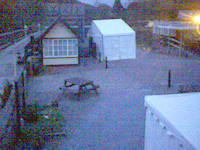 Webcam kindly provided by Churnet Valley Railway. 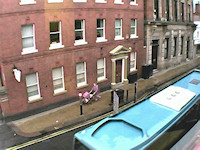 Here are some non-Staffordshire webcams from around the world which I think are great. All require broadband. 360 degree - The Monument, London webcam - This one is a full 360 degree panoramic webcam showing the view form the newly restored Monument in London. Leicester Square webcam - This camera can be controlled, View movie stars with this one. Times Square, New York streaming webcam - This one even has sound!, double click on the view to go full screen. This one has been going for years and is one of the best around. Las Vegas streaming webcam - This one allows you to take control of the view and the zoom. Santa Barbara Coffee Shop streaming webcam - Watch people drink coffee !